Carbon exists in a variety of structural motifs as a result of its ability to adopt sp-, sp2-, and sp3-type bonding modes. Graphite, diamond, and lonsdaleite (hexagonal diamond) are well-established allotropic forms of carbon, but in recent years fullerenes, nanotubes, graphene and even amorphous carbon have received a increasing attention as a result of their unusual, and potentially technologically useful properties. Glass-like carbon (GC) is a class of nongraphitizing carbon made by firing polymeric precursors such as phenolic resin or furfuryl alcohol resin in an inert atmosphere. Type I GC, which is produced at low temperatures, consists mainly of randomly distributed, curved graphene layer fragments. Type II GC, fabricated at high temperatures, contains self-assembled, fullerene-like, nanometer-sized spheroids dispersed within, and interconnected by, a three-dimensional disordered multilayer graphene matrix. 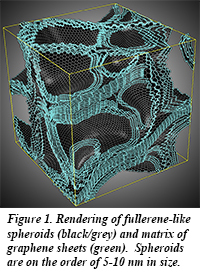 Type II GC can therefore be envisaged as fullerene-like spheroids encased in disordered graphene layers with a nanostructure like that shown in Fig. 1, which has a number of similarities to mechanical metamaterials, but with statistical characteristic building blocks (that is, fullerene-like spheroids) at nanometre scales. It is well known that graphene has very high in-plane strength, while fullerene has a large volume deformation capacity, and so the hybrid type-II GC is expected to have the integrated features of both materials to possess exceptional mechanical properties. 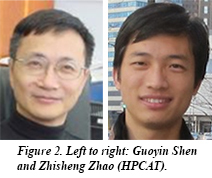 At HPCAT, a group including Director Guoyin Shen and postdoctoral associate Zhisheng Zhao, along with collaborators from HPCAT, University of Chicago, Yanshan University and China University of Geosciences has found that the hybrid Type II GC possesses a number of advantageous properties such as high strength (> 3 times stainless steel), high volume compression, superelastic (rubber-like) recovery from large volume deformation (～40% volume reduction), high uniaxial strain (up to 6% strain compared with that of the shape memory alloy), and a pressure-induced variable (zero or even negative) Poisson's ratio. Recently developed, in-situ techniques for direct volume determination, acoustic wave velocity measurements, and x-ray diffraction at HPCAT, along with molecular dynamics simulations, were employed to explore the nature of the unusual and pressure-tunable, compression and elastic properties. Controlling the concentration, size and shape of fullerene-like spheroids with tailored topological connectivity to graphene layers is expected to yield exceptional and tunable mechanical properties, similar to mechanical metamaterials, with a potentially wide range of applications. The discovery of fullerene-like spheroids encased in a disordered, multi-layer graphene matrix opens a route for the preparation of new forms of carbon that feature combinations of two or more carbon allotropes. Such combined forms may display properties superior to the properties of either of the components, and perhaps unique combinations of tailored mechanical and electronic properties may be obtained [Z. Zhao et al., Nature Comm. 6, 6212 (2015)].